Hi my name is Laura, I'm an artist and this is my pitiful plea to increase my fans on my Facebook page. On my Laura Medeiros-Art stuff fb page you will witness my trials and tribulations, and experimentations, and successes with my jewelry art. 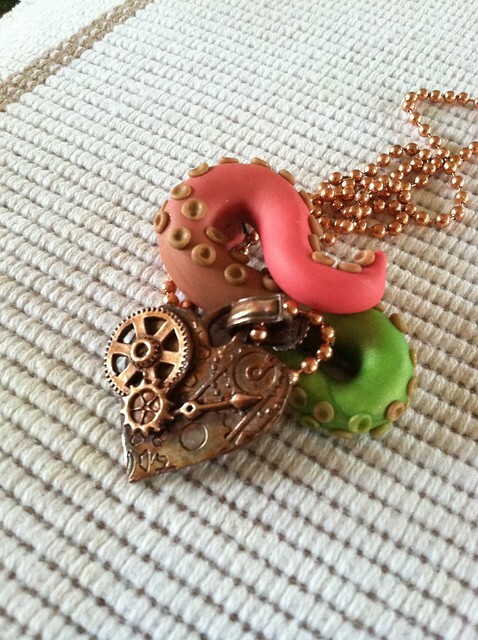 I use art clays: polymer clay and metal clays to make sculptural art jewelry. I am not above transparent ploys such as bribery to increase my views. As a matter of fact I embrace bribery, but instead we will call it a "promotional give away". So go over to my Facebook page (pleeeezzz): http://www.facebook.com/pages/Laura-Medeiros-Art-stuff/147377941945717 and like it. On August 1, 2012 I will throw all the names of my "fans" into a hat and pull two winners. Under the Sea give away: A copper pendant featuring a sea horse and an olivine cubic zirconia, and an acorn fairy house for a beach loving fairy.